Hva Shang, meaning ‘a Chinese monk’, was sent by Emperor T’ai-tsung of China with an elegently worded letter to invite the Sixteen Arhats to China. 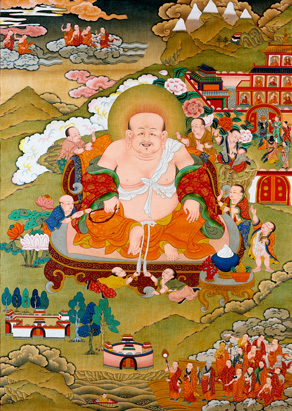 He accompanied them as they travelled to China where they observed the three Months’ Rains Retreat and taught extensively from the three pitakas, the three collections or 'baskets' into which the Word of the Buddha is divided. They are Vinaya, Sutra and Abhidharma. This page was last edited on 15 December 2016, at 12:02.